Our Bike Computer Odometer Speedometer can record the CURRENT SPEED, ODOMETER, TRIP DISTANCE, MAXIMUM SPEED, AVERAGE SPEED, CAD Cadence, Max Cadence, Average Cadence, ELAPSED TIME, CLOCK (Only 24H Mode) during your biking! This bike speedometer with a Cadence is great for bicycle training and doing exercise. Let's make our sports life more comfortable and free! (1) Specific tire size enables accurate calculations of the bike computer. (2) One end of the sensor should RIGHT FACE the cadence magnet, the other end RIGHT FACE the speed magnet, or it will not record the correct data of the bicycle odometer. (3) The distance between the magnet (both cadence magnet and speed magnet) and sensor should be less than 3mm, or it will record the incorrect data of the bike odometer with cadence. 【Easy to Install & Use】 Follow instructions from user manual or picture description of the bike speedometer odometer, and you will set up the bicycle speedometer within a few minutes. 【Multi-function】 The bicycle bike computer can record lots of data including CURRENT SPEED, ODOMETER, TRIP DISTANCE, MAXIMUM SPEED, AVERAGE SPEED, CAD Cadence, Max Cadence, Average Cadence, ELAPSED TIME, CLOCK (Only 24H Mode). 【Accurate Recording】This kind of bike speedometer has the cadence sensor magnet, it upgrades from the general speedometer and make the record more accurate. 【Large LCD Digital Display】 Bike computer with big size screen help the rider read all the data easier, four buttons are hidden upon or under the display. 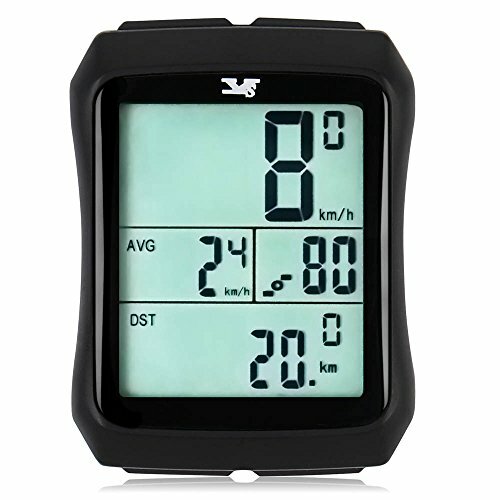 【Waterproof and Wireless Design】Wireless waterproof feature makes the bike speedometer odometer work well even in a rainy day. If you have any questions about this product by 007KK, contact us by completing and submitting the form below. If you are looking for a specif part number, please include it with your message.